How lifelike in texture and feel is a 3D anatomical breast model? Can they be used to teach breast self-exam patterns? How lifelike a 3D anatomical breast model is depends entirely on the specific type of model selected. Some models are designed to represent a breast in all aspects, including the texture of the covering material. Other types of models are designed to clearly represent common tumors and masses within the breast in greater detail. Still other options may include the internal structure of the breast that changes due to a variety of different health issues including breast cancer. 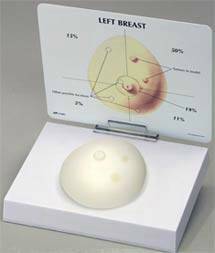 The full likeness breast model is very helpful in teaching the breast self-exam patterns. The physician can model the technique and the patient can then practice. This is often much more comfortable for the patient than practicing on her own breast in front of the doctor. The other common option is to have the patient practice the patterns on the model and then complete a self-exam with the doctor able to provide information, technique cues and corrections as needed. Are there different types of 3D anatomical breast model and which one is best for a medical school laboratory setting? Any of the high quality, life-size 3D anatomical breast model options are a good addition to any medical school laboratory setting. 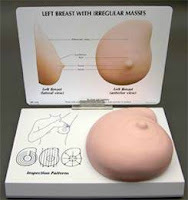 One of the best options is to have both the external breast model as well as the cross section model. This allows students to learn how to detect the lumps, tumors and masses common in breast tissue and then see into the internal structure of the breast. By looking at the underlying tissue damage and the structural formation of the breast a deeper understanding of treatment options and possible complications is developed. This is essential in diagnosis, treatment plan development and working with actual patients and their families. Students can also use the full size 3D anatomical breast model to learn how to teach about breast self-exam patterns as well as how to talk to patients about early detection and the need for routine breast exams and mammography. Is there a detailed 3D anatomical breast model that shows the entire breast in cross section? The 3D anatomical breast model of cross section of the breast is highly detailed and provides clear visual information about the common pathologies. These will include cysts, fibroadenoma, adenocarcinoma as well as infiltrating scirrhus carcinoma. The information card behind the model provides both the medical terminology as well as additional information about the structure, growth or mass. In addition this type of model will also provide information on the underlying structure of the break. This includes the muscles, ribs and the lymph nodes. Having this additional information is important in understanding all aspects of treatment of breast cancer including mastectomies and other surgical procedures. The model will depict how sometimes these underlying and supporting tissues can be affected by the growth or cancer and how their involvement will have a great bearing on the treatment options possible.